As I sat in the blistering heat, near the boundary, in the South Stand, Ntini, between balls, signed every bat, cap and match programme held out to him. He smiled, had a word, and joked with each an every person that hung out something for him to sign. Ntini is a legend of South African cricket, and a great guy. His speed may be decreasing with age, but his smile, patience and enthusiasm have not. However this is sport. If being a great guy was enough to keep you in a team then Ntini and Shaun Pollock would be leading the South African attack forever. The way Strauss took Ntini apart in his only 3 overs on day 2 had the Protea’s alarm bells ringing loud and clear. There were calls in the media for de Wet, the debutant who was the pick of South African pace bowlers in the first Test, to keep his place at the expense of Ntini. However Smith and the Protea selectors back Ntini and he kept his place. Whether it was sentiment, hope and true belief matters little, for Ntini is not the bowler that has lead this attack for so long. Like all mortals his time has come. Today, day 3 of the 2nd Test, has seen Ntini bowl better than his opening spell yesterday. But he is not effective. He doesn’t look like getting a wicket, no matter how hard he tries, and with Ntini the effort is never in doubt. As Cook and Collingwood take control of the match Smith is burdened with what is really a two man attack. Kallis is not fully fit to bowl, Harris is having a rare off day, Ntini is running in to no real avail, and Steyn and Morkel have to much to do in the sweltering heat. Whatever happens in this Test, with 2 days and a session to go, all options are still open, the Protea’s must act accordingly and realise that they are lucky mistakes were made with games still to make up. In Cape Town next week de Wet should play in place of the fading Ntini. If political reasoning bully’s selection then either Tsotsobe or Parnell must play. Sentiment has no place in professional sport, no matter how much we think it should. Watching Ntini with the kids one hopes that he can prove people wrong and bowl South Africa to a win here. All South Africans would love to see that. But this isn’t a player short of form, this is a player who’s age, and long career, have caught up with him. The extra yards of pace aren’t going to return through will. Ntini is a legend and must be remembered as such, and not as the fading speedster who’s struggling to make an impact. On Saturday and Tuesday Bafana Bafana debuted their new World Cup shirts, and while looking stylish in their new Adidas kit, the gleaming yellow shirts weren’t inspiration enough to break Bafana’s goal scoring drought – even with recalled Benni McCarthy. At least they didn’t lose. Two 0-0 draws, against Japan and Jamaica, may not inspire confidence in the host country progressing to the second round of the World Cup, but not losing was a step in the right direction, post Joel Santana. What South Africa needs, with dwindling confidence in the national team, is the imagination to be caught by Bafana fever, with support from the people lifting those on the pitch, as it’s clearly not happening the other way around. Initiatives like the one asking people to wear a Bafana jersey to work on Friday’s are a sound way to drum up national support and bring back pride in our team. So with a new shirt, the one that will be worn during the World Cup, no on sale we can expect Bafana fans to go out in mass and cover the country in a sea of yellow, swelling the pride we have in our team, and hopefully translating that onto good performances on the pitch. Sound reasoning right? There’s one thing that can throw a spanner in that plan, and by spanner I mean totally kill the idea. The price of the new Bafana jersey? Between R1200 and R1500 depending on where you shop. Insanity or greed, perhaps both, is at play here. With a country struggling with poverty and unemployment Adidas, or whoever has dreamed this price, have made the jersey of the national team of the national sport, out of reach to those real supporters who love the game and love the team. At a time where we should be bringing the country together to ensure that Africa’s first World Cup will be a success this aberration has insulted the people of South Africa. Firstly, who can afford to pay over a grand for a football replica jersey? Secondly, who would want to? Apparently the only ones who can afford the new jersey are those that will probably get it for free, the players, the SAFA and Adidas boards, and the countries president. The people, the real fans, will have to make do with knock offs and the old jersey, and while I am completely against buying fake goods, and wouldn’t do it myself, this is one instance where’d I’d fully support such illegal actions. The average man should be able to buy the shirt of the team he supports, not the highest earning 1% of the country. Adidas have made a cheaper shirt available, one that does not have the Protea badge on it, which is available for about R599. Again two points to consider here, firstly, while R599 is still on the high side, and still way to high for the average South African, how insulting is it to say to Bafana fans that you can’t afford the real thing, so here’s a cheaper option that isn’t quite the real deal? Secondly, who are they trying to fool by suggesting that one little badge costs an extra grand? Brian Kerby, the managing director of Adidas, had this to say at the launch “We also wanted to incorporate something that will symbolise the unity of South Africans and we chose the South African flag, which is prominent on the front of the jersey. 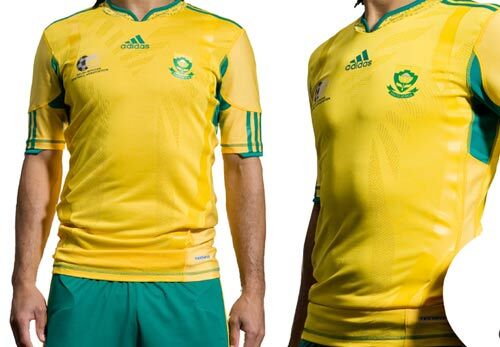 The jersey defines who we are as South Africans.” Nice sentiment, but how about making it affordable to South Africans? Hopefully parliament, who likes to make their views clear when it comes to Rugby and Cricket, will make a big fuss and investigate what exactly is going on here. They’ve already said that no more jerseys will be produced without the Protea badge. Hopefully this doesn’t mean that the only price available will be R1500. Until the price drops I won’t be buying the new jersey of the team I support, and I’d suggest that everyone do the same. We need to take a stand against greed. While we’d all like to believe that sport and politics shouldn’t mix we inevitably find that they do. Generally it’s politics pushing it’s way and forcing itself on sport. The issue of Zimbabwe is one where it seems that opinion is divided almost evenly about whether politics should gatecrash sport. But what should be done? England have pulled out of touring Zimbabwe, South Africa have cancelled their agreement with Zimbabwe, an agreement that saw Zimbabwe take part in South African domestic cricket, New Zealand have said that they will tour, unless otherwise told, Pakistan A have likewise said they will go to Zimbabwe, and Zimbabwe have pulled out of next years T20 World Cup in England – after being told their players and officials would not receive visa’s. India have put their power behind not excluding Zimbabwe from the ICC and removing their status. Is all of this necessary? It took over 20 years for when South Africa was barred from international sport to the ending of Apartheid. In the end sport did not matter or make much of a dent. The ruling party had to cave in in the end, but it was not because of sport that they did. The difference here is that South Africa’s discriminatory laws were voted in and practised by many of the minority white population, year after year. The Zimbabwe situation is different. A dictator and his party are forcing themselves on the people and will not go away. The threat of sanctions is a popular option by many in the west but it shows a fundamental misunderstanding of the problem. Mugabe does not care about the people of Zimbabwe. Sanctions will harm and kill the people, while Mugabe will be unaffected. So why would he care if sanctions were forced on the country? The same applies to sport. What ever the ICC or individual countries apply with respect to Zimbabwean cricket will not effect or harm Mugabe in the least. It will have no affect at all on the worsening situation in the country, in terms of a solution, but will harm the Zimbabwean people. South African players have said that they will not tour Zimbabwe. This is all acceptable as it is their safety that is at stake. So if any sportsman says that they will not tour on safety grounds then this must be accepted. Politically they should not have a say. Zimbabwean sports teams should be allowed to continue to tour other countries. The players need to earn a living in a country that food and basics are alarmingly scarce and expensive. Denying them this right is hurting them and their families, while Mugabe continues to live it up at their expense. Robert Mugabe does not care about the people of Zimbabwe. That much is evident. Sanctions and sporting bans do not effect him but only the people of Zimbabwe, and he will not budge to help them. Sanctions and sporting bans are not the solution to this problem, and thus should not be implemented. The Zimbabwean cricket players should not be prevented from earning a living when it does no good at all to the situation in the country. They are not at fault and should not be made to pay for the madness and brutality of one man. Charl Langeveld must be commended for taking a stance and bravely making a decision, which while being extremely difficult for him, can only be good for South African Cricket. By opting out of the forthcoming tour to India, clearly showing those at CSA and the selectors, that he will not stand for being picked on the basis of his skin colour but on merit alone. Langers is not allowing himself to be used as a pawn for others gain, and has put worth to his, and all players, right to represent their country. The right to play for your country belongs to everyone. The players with the best ability must be chosen, and not the whitest or the blackest players. Talent, skill and ability are all colour blind, and so should our selection procedure be. When Langeveld withdrew himself from the squad, and suggested that Andre Nel, who he had replaced, deserved his place in the squad, two things became abundantly clear; 1) that non white players will not allow themselves to be token selections, to make up certain racial targets, and 2) most importantly, that the team spirit amongst the players is strong enough that Langeveld will try to correct perceived injustices against one of his team mates by sacrificing himself. It is inexcusable, unfair, and simply embarrassing to put black players in a position where they feel that they are not being picked on merit. Well done to Charl Langeveld for taking a stand, one that he should not have had to take, and hopefully will not lead to him being lost to South African cricket. The Cricket South Africa should be protecting its players and not putting them in difficult positions. The forced transformation policies, or quotas, that Cricket South Africa is enforcing, are beginning to poison the game at international level. Evidence of the problem arose during the public slagging match between CSA president Norman Arendse and Protea’s coach Mickey Arthur over the racial composition of the touring squad to Bangladesh. Arendse insisted that all squads have 6 non white players for a 14 man squad and 7 for a 15 man squad, while Arthur professed the need to have the best players selected, on merit and not colour, and for consistency in selection. While Arthur seemed to have won that round it was obvious to everyone that Arendse would not change his view. 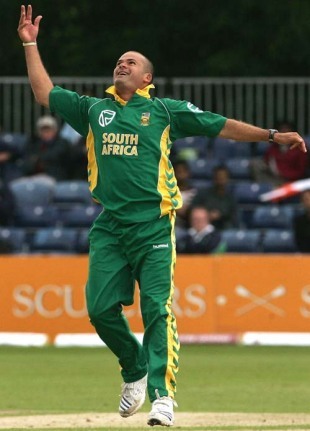 This became evident when the squad to tour India was announced and Andre Nel, who has been a regular player in the Test team for a few years, was suddenly left out in favour of Charl Langeveld, and subsequently bringing the racial composition of the team up to Arendse’s target. Not withstanding that Langeveld is a very good bowler, and worthy of a place in the team, it was abundantly obvious to everyone that a white player had been dropped and replaced by a non white player. This is no way to treat either player, and is an insult to non white players more than anything. Nel is said to be so upset by what has happened that he is considering his future as a South African player. To be dropped because of skin colour is a definitive step backwards for a county with a past immerged in racism. Langeveld has since pulled out of the tour, citing the emotional damage that such treatment and controversy has done to him, that he would not be able to give his best under the circumstances of his inclusion. This from a player who clearly sees that he is being used as a pawn for political gains, and wants none of it. “As players we all have a good idea of when we are clearly in the running for selection and when we aren’t,” Langeveldt said. “You just have to look at Andre’s Test record compared to mine and the fact that he has been part of all the Test match plans while I haven’t played a Test match for two years. The players are fully aware of the poison that is seeping through their game and, as sportsmen, want to be picked solely on merit, and not on race. CSA is leading South African cricket down a dangerous path that will only include more turmoil and suffering for players, and increase racial tensions within the country. Black players do not want or deserve to be treated as pawns. Their ability and talent is questioned by such actions and the pressure put on them can only damage careers. CSA needs to talk to the players and not pander to their own goals, while harming those they should be representing, and the game as a whole. You are currently browsing the archives for the South African Politics category.